I spoke at an event for women in construction management recently and I was a bit put on the spot when they asked me to share a tip that had helped me most in my career. Assume you’ve got permission until told otherwise. Own it. Don’t wait to be given the authority if it’s within your gift to take it. On the way home I realised that is not the tip that has helped me most in my career. The attitude that has helped me grow and develop my career in the direction I most wanted to was something else entirely. Really, career confidence is about having options. You can face a lot of challenges at work if you know you can pivot and make something else work for you. I went through a difficult time at work on a really hard project a few years back. I remember sitting in a taxi with three senior managers – my customers. We’d left a meeting with a supplier which had resulted in a project plan. In other circumstances I might have been happy to have input into the document, and to have executive stakeholders who actually cared enough to contribute. But on that day, all I could think about was that we weren’t the right people to be putting together the plan. The developers weren’t involved. The test team wasn’t involved. The business users weren’t involved. The trainers weren’t involved. Anyone who would actually be doing a task on the plan had been overlooked. And I knew that the plan was unachievable. I was in the front seat of the taxi and I had sunglasses on. In the back, the men chatted between themselves. In the front, I was crying. You know, the quiet, slithery-down-your-cheeks-don’t-let-anyone-see kind of crying. Tears of total frustration. I had pulled myself together by the time we arrived at our destination. Professional face back on, and all that. But it was hard to be so personally invested in a project and yet to know that we’d set ourselves up for failure. No one had listened to my concerns in that meeting. The thing that kept me going on that project was knowing that I could quit. I didn’t need the job. 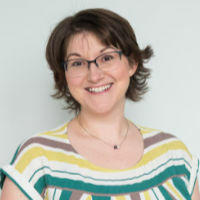 I turned up to work every day because I chose to, because much of the project was fun, because my team was awesome and I felt a professional responsibility to see it through. But at the back of mind was always the knowledge that if it got too bad I could walk away. Going into work every day knowing that it was my choice and that I had options changed the way I looked at my involvement. It gave me the confidence to get through the difficult days and the mental distance to deal with the low points (and there were a lot of them). I’m sorry I didn’t think on my feet fast enough to tell you this story. The best tip I have for your career is to plan how to leave your job gracefully. 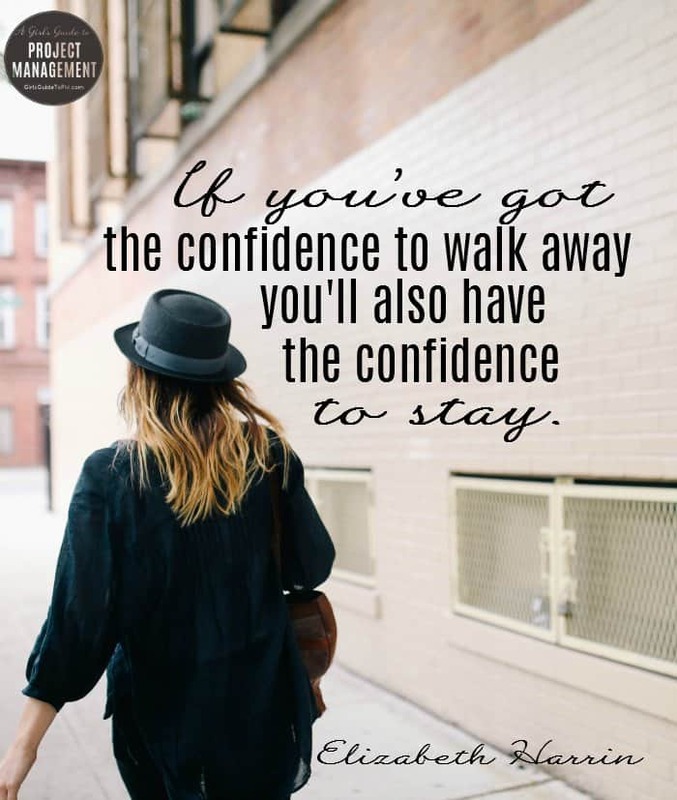 If you’ve got the confidence to walk away, you will also have the confidence to stay. Be wise with money. You can’t believe you can walk away from your job if you need the next pay cheque for food. Build your network in and outside your current company. They will help you find a new position if you ever need it. Stay relevant. Keep your skills up-to-date. Know that you’ve got something to offer your current employer and your future ones. Believe in your own abilities. You’ve got this. And you’ve got the next job, and the next. Setting yourself up with options doesn’t happen overnight, but you can do it. 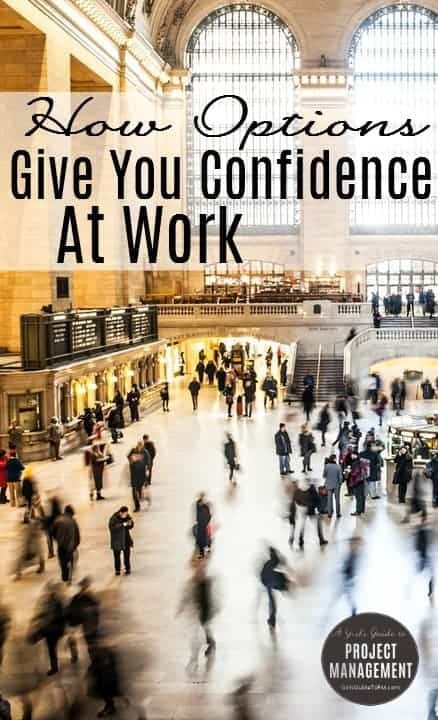 If you’re having trouble with any of this, click below to get my ebook, Overcoming Imposter Syndrome, which will show you how to build your personal confidence at work. Actually, it won’t help with the money part – talk to your financial advisor about that bit! Use the code ‘options’ to get 10% off Overcoming Imposter Syndrome. Find out more and buy here. Very bold and sound advice Elizabeth. It is true on so many levels – having options contributes to your state of mind, ability to stay calm under pressure, and standing tall as a leader. Standing tall – I like that! I think part of it is about knowing what you stand for and making sure that your values aren’t compromised by someone else. Excellent advice! What is the rest of the story on that difficult project? I am very curious as to how it worked out. Unsurprisingly, the plan we came up with during that meeting was unrealistic and unachievable. We didn’t meet it, but I never expected to. I replanned with the team, involved the right people and we used that plan. It was a difficult project, we had lots of slippages and challenges along the way and ended up delivering what we intended to about 3 months late. Given all the ups and downs it wasn’t a bad outcome! Great confidence advice for young project managers. Notably courageous post amongst your always-interesting and valuable blogs. Thanks, Buck. This one took some effort to write, I don’t mind admitting!